Hello, I’m Beth and I’m a grocery store addict. When I have free time, shopping in specialized or ethnic grocery stores makes me as giddy as a kid in a candy store. My favorite Middle Eastern store is so packed with interesting spices and specialty food items that it’s like sensory overload for me. But there’s an upside to my fetish. Frequently I discover new flavors and naturally unprocessed food items to incorporate into my eating and cooking that I might not discover otherwise. Dates, for example, appear in many Middle Eastern cuisines and can be used for any meal and in sweet and savory applications. In fact, the medjool date can be so sweet and luscious that my husband actually asked if they were candy. And as it turns out you can coax that naturally sweet goodness out of those dates and create date syrup or molasses. If you already use agave nectar, maple syrup, or honey as a sweetener instead of refined white or brown sugar, it’s time to add date syrup to the list as well. Once you taste it, you’ll wonder where this fruity natural sweetener has been all your life. In August, Sarene Wallace and I challenged our virtual cooking community, Tasting Jerusalem, to cook with date syrup and we ended up with so many interesting uses ranging from sweet to savory and applicable to every meal of the day. Read the August Tasting Jerusalem post for more in depth background information on this molasses-like ingredient. I’ll concentrate here on how to make your own with links to several easy recipes using it. In addition, there are several brands of date syrup available either in Middle Eastern markets or online which contain no preservatives or added sugar, so purchasing it is indeed an option. But homemade is easy and worth the minimal effort. The basic process is to boil medjool dates and water until the dates begin to break up and the water volume reduces. 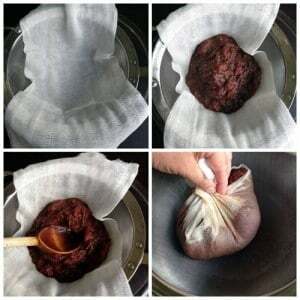 Then you strain the mixture, preferably through cheesecloth so you can wring every bit of syrupy sweet goodness out of the dates. Then depending on how much liquid you have left and its taste and consistency, you can then reduce that liquid, usually by about half to either a syrupy consistency or even thicker to a molasses-like consistency. Then just use the liquid as you might use maple syrup. It packs a similar amount of sweetness and can be substituted one-for-one in any recipe or creation where you might use maple syrup. 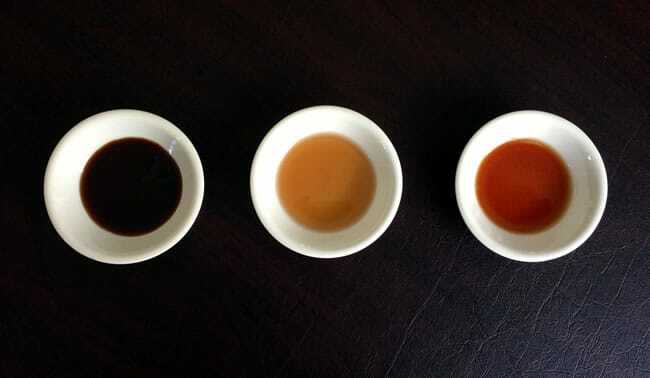 Left to Right: Store-bought thick molasses; pre-reduced homemade date syrup; final, reduced homemade date syrup. When I first bought a jar, I poured it on waffles, yogurt, and ice cream; used it to sweeten smoothies; and subbed it for maple syrup in a granola recipe. But don’t shy away from using it for savory dishes as well. Here are lots of ideas to get you started. These recipes will keep you coming back to your newfound sweet companion over and over again. And if you become addicted to it, you can thank me. How about these incredibly simple Chicken Wings with Date Syrup by another unprocessed contributor, Hannah from the blog Blue Kale Road. Or how about this recipe from the Washington Post for Chicken Baked with Date Syrup and Pomegranate Molasses (remember my October Unprocessed guest post from last year?). This recipe is also simple enough for a mid-week meal, and you could include Roasted Delicata Squash as a side dish. And of course it would be an ideal addition to a salad dressing. Here’s an idea of how to use it in a refreshing salad course, this one a tangy Middle Eastern creation by Michele Kayal of the bog The Hyphenated Chef. Here’s a perfect snack application: Mix the date syrup with tahini (a Middle Eastern sesame paste) and you will have the “peanut butter” of the Middle East. Spread it on your favorite peanut butter receptacle and munch away! How about a mocktail using date syrup – Samantha from the blog The Little Ferraro Kitchen offers this wonderful Middle Eastern inspired drink called Jallab. Here’s that granola recipe I mentioned above – Pumpkin Pie Granola Sweetened with Date Syrup. This is a method more than a recipe – you can easily use more or fewer dates – the key is to pay attention to the general ratio of dates to water, the volume of water as it cooks, and most importantly the taste. Put the dates and water in a medium saucepan on medium high heat to bring to a boil. Then turn the heat down to med low and allow the mixture to simmer. If you see foam appearing on the top, skim it off (same thing you do when making soup stock or jam). Using a wooden spoon, mix occasionally and smash the dates with the back of the spoon. After about 15 minutes of simmering, take it off the heat and let it cool. Now set your strainer lined with cheesecloth on the top of the bowl and pour the mixture through. 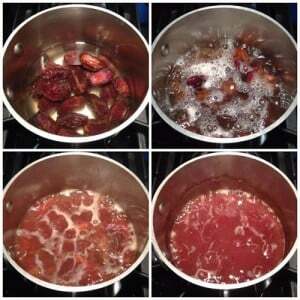 Use the wooden spoon to coax much of the liquid out of the dates. Then wrap the cheesecloth around the date mixture and wring it out as you might a wet rag. The liquid will keep coming. Don’t leave any behind. At this point, I was left with about 1 2/3 cup of sweet goodness. Give it a taste to get an idea of the sweetness. Mine was yummy but too thin and not quite intense enough yet. I poured the liquid back into the pot I was using (but cleaned) and brought it back up to a boil. Then I reduced the heat to medium low to maintain a low boil and reduced it down to about ¾ cup of liquid. This took about 20 minutes. You don’t need to be standing over it the whole time – put a timer on and check it every five minutes or so. If you note on a spatula at the start how high the liquid is when you dip it in, you can use that spatula to get a sense of how much you have reduced as you boil it down. Or, just use your taste buds and eyeballs and a spoon. When it starts to coat the back of a spoon, it’s getting thicker. When it tastes more intensely sweet, it is reduced. 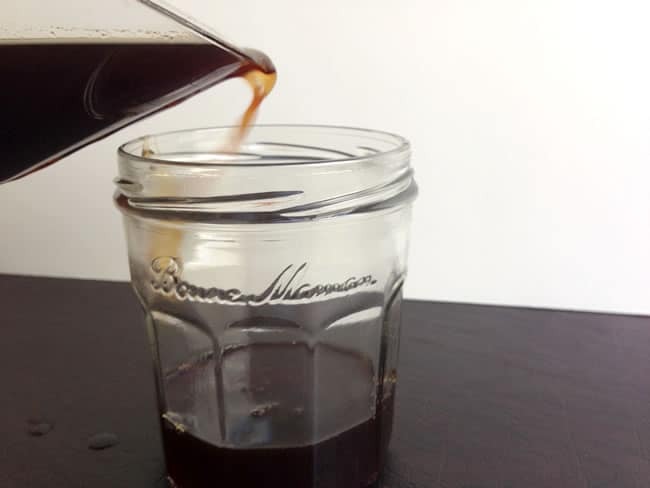 I stopped at a syrupy consistency – it tasted just like liquid dates, exploding with sweet flavor in my mouth. So I took it off the stove, let it cool, and bottled up the liquid goodness, storing it in the fridge for safe keeping. Date paste is really thick. I love it and have used it but I think I’ll try cooking the dates till soft and then using the immersion blender to thicken the syrup. I would still use it as a maple syrup sub or honey sub but I think the nutrient and fiber retention would be good as well as the flavor. It’s on my ‘need to try’ list now………. I love your idea Karen and may try that next time too. Let me know if you try it, how the texture comes out! I have started making this in my InstantPot with a strainer in it. I place my dates in the strainer in the liner. Pour in the water, cook on Manual for 10 minutes, then do a Quick Release. Use either an immersion blender or a potatoe masher to mash the dates. Then, remove the strainer to a bowl, continue to mash the dates until no water is left. Then, add the liquid in the bowl to the rest on the liner. Then, I boil. Makes it so easy! And so good!!! I never have gotten around to making the first recipe mentioned above, but I can heartily recommend the second! I’ve been making those for years, to rave reviews. always looking for better sugar alternatives and this looks well worth a try – thanks so much for sharing! any chance you have an idea of how long it will store in the fridge? Hi Rebekah! Well to be honest, my store-bought and homemade didn’t last long at all because I used it so much :-). But my guess is that it would be similar to maple syrup. Pure maple syrup will last indefinitely unopened in a cool dry place and once opened, in the refrigerator for a year. If you make the date syrup yourself (do it!) and refrigerate it, I would say without a doubt 3 months and probably longer, just like maple syrup. I’m wondering why not puree the broken down soften dates into the liquid to make it thicker and retain the fiber. ? I can see cooking with this. Thanks. Good question Karen. 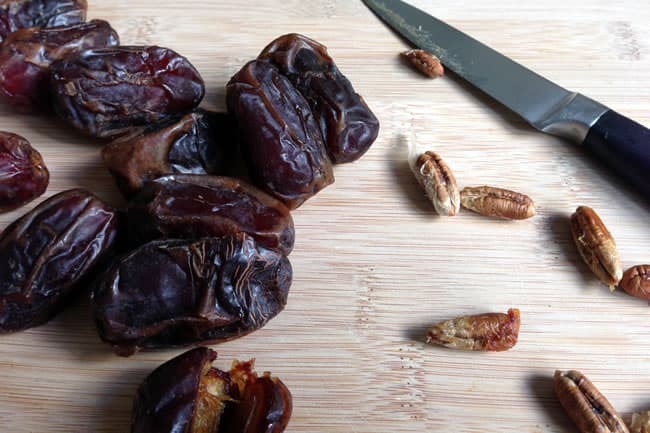 When I was researching this, I definitely came across many recipes for vegan raw date paste and I think that would be another great way to go. Or as you suggest, just blend the cooked dates and liquid. I really like the clear liquid because I know it can sub one for one for maple syrup or honey but if you want to retain the fiber, I think it’s a great idea to whir it up in the blender cooked or uncooked and then add to yogurt, smoothies, probably quick breads, and so much more! This is what I did, it came out a little less syrupy and more like a thick purée, but it worked just as good as a sweetener. It was delicious!